We love the rich tones of this high resolution Agate image offering details not visible to the naked eye. It is one of those dress-up, dress-down scarves that will be much appreciated by friends and colleagues - and commented on. 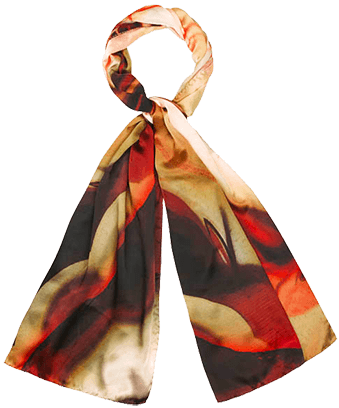 The scarf is an exceptionally large 198 x 68 cms satin silk, sourced in China, and digitally printed near Lake Como in northern Italy. It is now offered at less than half the retail price, but please note we only have one left - literally.